In our years of waiting to build our family, we would often lose hope that it would ever happen. We would question if the word hope even existed. And when we started seeing others build their family, we would often feel defeated and hopeless in our journey. While we were waiting, I went on a missions trip with our church. At the end of each day, we were asked where we saw God working in our daily task. We knew the question was coming so we began to look for God working throughout the day. Our answers varied—sometimes we saw God working in a conversation with a person, sometimes it was through a kind act, or sometimes it was God creating something sacred in us individually. It became the start of something new for me–to look for God in the daily. He’s already there….but when you look for God..you see God clearer and you don’t miss a moment. You have a perspective change. I began to write down where I saw God in the daily moments and interactions. He was in the little notes left by my husband, He was in the conversations I had with friends, and He was often found in my workplace…a homeless shelter. He was reaching me in ways I never noticed before. He was in moving in my daily and creating beauty all around me….and I finally began to see it. As I began to see Him more clearly, I quickly saw where He was leading me. He was leading me back to hope. Step by step..….He knitted our story together. He knew our future child and her birthparents…..He already knew how our story would unfold. Seeing God and being thankful in God for what he has done, grew my confidence of what he’ll continue to do, both in the daily and in the bigger moments. This ultimately rekindled my hope. We seek Him. We thank Him. We build our hope in Him. You have to create your own hope…and hope for me came from creating a thanksgiving spirit. When you become thankful…you become hopeful. Always. 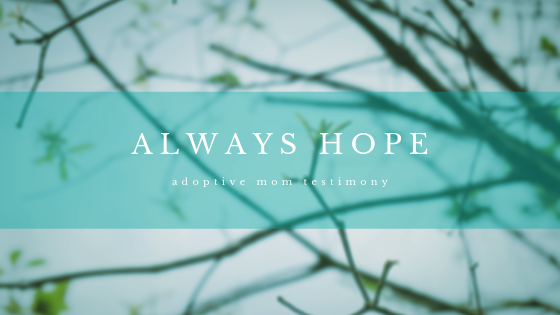 And being hopeful will completely change your perspective of the adoption process. 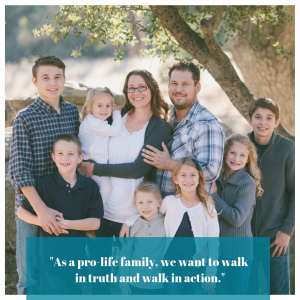 We have to protect our view of the process, because adoption is the most beautiful adventure this mama has ever experienced. Always Hope. A couple of years ago my husband and I got hooked on a survivalist reality show. The feature setting this show apart from other survivor type shows is that the contestants were entirely alone. They were responsible for everything (including filming). Dropped off unaccompanied in a remote area, the participants hunted and foraged for food, built shelters, and risked their lives for the grand prize. The only margin between remaining in the game and going home was voluntarily sending a call from a satellite phone, in which they were immediately removed. Faced with wild boars, wolves, and poisonous berries…and yet the most common call on that satellite phone was made because competitors were feeling alone. Desperately missing their families, many grown men and women pressed the button on the phone to get home. Something these contestants quickly learned is the innate human need to not be alone. Some hit the button after 40 days and some after only 24 hours, but a majority hit it in despair to see family, hug family, feel the safety of family. The most prepared and capable people of being alone, simply cannot. Imagine now, a toddler boy. Bright eyes, long lashes. Chubby hands and smooth skin. He is not a wilderness survivalist, but he too has no familiar shelter. He is suddenly in the home of strangers. He too wonders about food. The afternoon eases into evening. When the lights go out, fear grips this little boy in the scariest moment of his life. In tears, he turns over his shoulder looking for the one consistent person in his life, his little sister. The home he does not know, the adults he does not know, but his sister, his sister is like a thread of his own fabric that cannot be unraveled from him. There is no stress-free way for a child to be placed in foster care. Abuse or neglect leads up to the removal and the removal itself can be very distressing. Just like the contestants in a contrived TV show, these kids long for reliable food, safety, and most of all to not feel alone. 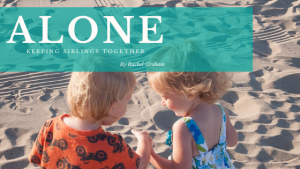 In many cases, every effort should be made to keep sibling groups together. As you can envision, not all foster families have the ability to accept multiple children at a time. How sad for the toddler boy who looks over his shoulder and doesn’t see his sister. He reaches for the hand he knows, and it is not there. That satellite phone seems like a luxury in life’s true survival situations. Psalm 68:6 tells us, “God sets the lonely in families.” We think the foster family must be where God is setting them, but truly, if children have siblings, then in some regards they already have part of the family to not feel lonely. Nightlight’s Homes for Hope house is making an effort to ensure that siblings stay together during those initial nights, when fear grips as if wild animals lurked outside. Having a home devoted to emergency sibling placements is a safeguard against the fear and loneliness throughout the transition. If adult survivalists use the satellite phone to get to their family, how much more do children need family in their reality? Nightlight and Adams County Social Services have opened two homes designed to provide safety, comfort, and security to children in foster care at a time when they are most vulnerable: immediately after being removed from their family. This new model of foster care, called Homes for Hope, is designed to provide temporary foster care for children in emergency situations. A large focus of the program will be keeping sibling sets together. 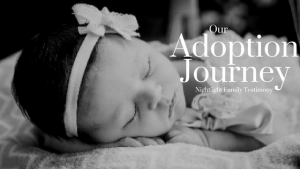 To learn more about Homes for Hope or the process to become a foster family contact Meaghan Nally at mnally@nightlight.org, call (970)663-6799 or visit https://www.nightlight.org/colorado-homes-for-hope-program/. How Do You Celebrate “Gotcha Day”? The term “Gotcha Day” has been used for many years by adoptive parents to celebrate the day their adopted child became part of their family. We recognize that not everyone appreciates this term. Some people instead call this special day “Family Day,” “Adoption Day,” or something similar. Regardless of what you call it, this is the day that your adopted child became yours for forever. Why is it important to celebrate this day? It’s important to celebrate your child and to recognize that your child came to you in a very special way. It’s important to celebrate the child’s heritage, birth country, and birth parents. Your child establishes his identity through embracing who he is and where he came from. Celebrating this day reveals to the child that you are aware of the culture and history of his background. It also enables you to recognize the importance of the child’s birth parents and their love for him. Everyone appreciates the opportunity to celebrate their child and the way their child came into their family. Families choose different days to celebrate. Some celebrate the first day the child was put in their arms. Some celebrate the court hearing that made that child officially a part of the family. Some celebrate the first day that their child met their whole family. It doesn’t matter what day you choose. In some families, the child may not be comfortable celebrating at all. 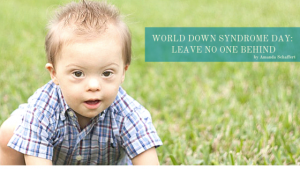 They may have negative feelings associated with the adoption process or parts of it. In these cases, another option is to celebrate National Adoption Day (the Saturday before Thanksgiving) with family and friends. 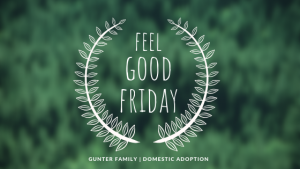 The focus in such a celebration can be on adoption in general, and such events can help reduce the stigma surrounding adoption as well. How do you celebrate “Gotcha Day” or “Family Day”? The Marvin family celebrates “Family Day” by recognizing their son’s birth country. In The Congo, people celebrate special days by purchasing Fanta Orange soft drinks in glass bottles. The family has incorporated this tradition into their “Family Day” to give their son the ability to appreciate his culture. The Inabinet family recently celebrated their 4-year-old son’s domestic adoption “Gotcha Day” by explaining to him in greater detail his adoption and that he has two mommies and two daddies. The next day the adoptive and birth families came together to celebrate Preston by spending the day at the zoo together. Preston was able to celebrate his adoptive family and still recognize and know his birth family. 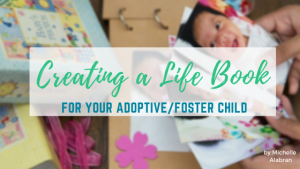 Create a book of the adoption journey and read the book to the child every year. Look at pictures of the child’s birth family or birth country. Go to a restaurant related to your child’s culture. Mail a care package to the orphanage your child spent their early years in. Tell your child stories of your visit to his birth country or the days leading up to his birth. Be intentional on this day to create new memories and record them in a special way. Take a picture as a family. 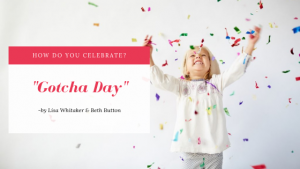 “Gotcha Day” or “Family Day” celebrations do not have to be elaborate, as long as they are meaningful to you and your child. It was only yesterday that we welcomed baby Grace into our home. She was born a preemie at 7 months and her mum plus sibling both passed away at birth. She weighed only 1.2 kgs and was still very under-developed, even the hospital didn’t expect Grace to make it. She was feeding through an ng tube and her skin was so pale. We spent the whole night praying that she would survive. She was severely dehydrated and needed lots of care and feeding. We fought, prayed and believed for Grace’s miraculous survival. Little did we know that Grace was as much determined to make it as we were. She was a fighter. Today we celebrate a miracle as we see grace being reunited with her biological father. We are in awe of this great and amazing journey of hope. Grace has grown into a beautiful and happy girl who is full of energy. She is a feisty girl and will fight her way through any crisis. She is very strong willed, fearless, and opinionated. She has a smile which is contagious, when she chooses to show it. Who knew that this little girl could actually be here to tell her story? Who knew that this tiny baby would grow into a lovely and flamboyant beauty? Who knew that even when people give up on you, God can actually redeem and restore? Grace was loved by many. We are so proud of the girl she is today. We are so thankful for what God has done and continues to do in her life. We are so grateful to God for giving us the opportunity to change her story. We are so grateful that our hope was not in vain. Grace was inconsolable on the day of reunification. It was difficult to see her in tears as we said our farewell, but we were comforted that she was in the hands of her parents who were excited and very grateful to have her home. Grace will always be loved and remembered in the home. Her smile and energy are missed every day. God has indeed been good and we can boldly say Ebenezer. Some folks might say we experienced a lot of “coincidences.” We don’t believe these were coincidences at all. We believe in Emmanuel – “God with us.” God is not an absent landlord, nor does He love us from a distance, uninterested in our lives. We give thanks and glory to God, for we experienced His goodness and grace during our 12-day journey. “You split the sea so I could walk right through it. My fears are drowned in perfect love. 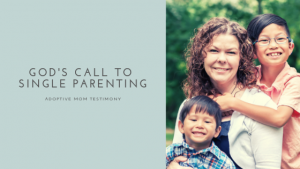 I was anxious while waiting to begin the legal proceedings to adopt our baby. There was another couple there adopting a baby boy; they were naming him Carson. Carson is not a very common name, but it happens to be the name of my brother’s son. Incredible! I was just shaking my head at all the little “coincidences.” It was as if the Lord was saying, “Why are you still nervous? I’ve got this covered!” All legal proceedings went smoothly, but it was nevertheless humbling and nerve-wracking being asked questions by our 4-day-old daughter’s state-assigned attorney. We visited the Cathedral of the Immaculate Conception of Kansas City. Some 10,000 people witnessed the laying of the cornerstone in 1882. We were dismayed to discover that it was closed, but the cleaning lady heard me tugging at the locked door so she let us in for an unofficial tour. The beauty of the stained glass took our breath away and we had the whole sanctuary to ourselves. Missouri law requires adoptive parents to remain in Missouri while waiting for adoption paperwork to be approved, but they may go anywhere in the state. We decided to get a head start on our trip home by driving three hours east, to St. Louis. While there, we visited the Cathedral Basilica, completed in 1914; we thought we’d been transported to Italy. Installation of mosaics in the interior began in 1912 and was completed in 1988. The mosaics collectively contain 41.5 million glass tesserae (tile pieces) in more than 8,000 shades of color. Covering 83,000 square feet (almost two acres), it is the largest mosaic collection in the western hemisphere. Next stop was St. Francis Xavier. On June 8, 1884, the cornerstone for the new church was laid. When we first arrived, we had the whole sanctuary to ourselves – again. At the altar, we prayed for the adoption paperwork to be completed, protection on our drive home and, of course, for our precious baby girl. Finally, all paperwork was approved and we were released to take our daughter home. 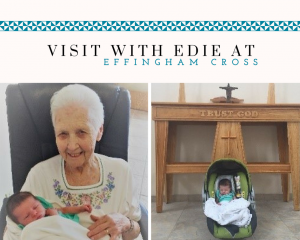 It was a five-hour drive to our hotel in Richmond, Indiana, but we stopped first at the Effingham cross. To our great joy, even though she was not scheduled to work that day, Edie was there. When my wife offered to let Edie feed our baby, her smile lit up the room! No other tourists showed up the entire 45 minutes we were there. Edie had sent a card to our home address after our initial visit, telling us that she and her prayer partner were praying for our adoption. Now she knew that those prayers had been answered. It rained almost the entire last leg of the drive; a five-hour drive turned into seven hours. We passed two overturned tractor trailers that were heading west. Only four months prior, we had bought a used Lincoln MKZ hybrid; we were thankful for the comfortable and safe ride home with an impressive 44mpg. 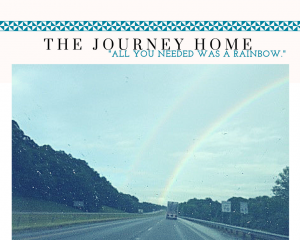 As I was telling a neighbor about our trip, she said, “All you needed was a rainbow.” I grinned from ear to ear as I showed her this picture I took on our way home. On Sunday, June 25th, 2017, we took our darling girl to Church for the first time. During communion, there was a worship song that I never heard before called “There is a Cloud” by Elevation Worship. “Hear the word roaring as thunder with a new future to tell, for the dry season is over. There is a cloud beginning to swell. Every seed, buried in sorrow, You will call forth in its time. The pastor titled his sermon “Joy,” and he showed a video of a song I’d never heard before, but which begs for a smile, “Old Church Choir” by Zach Williams. I got an Old Church Choir singing in my soul. We paid our house off last year, have precisely two pets, and have a close family. My wife and I are very active (we got to see a lot of places during the waiting stage of the adoption process). We didn’t have a gender preference listed, but deep inside my wife really wanted a baby girl. 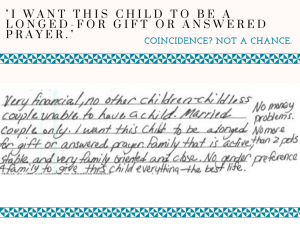 The one sentence that I read over and over was, “I want this child to be a longed-for gift or answered prayer.” Coincidence? Not a chance. We prayed, and in His perfect time, the Lord answered. Praise His holy name.